The Maps app on the iPad mini wouldn’t be very useful if you couldn’t use it to find things. Here is how to search for places you want to go and people you want to see — including people you have stored as contacts. Tap the Search field at the top of the screen to make the keyboard appear, and then type what you’re looking for. You can search for addresses, zip codes, intersections, towns, landmarks, and businesses by category and by name, or in combinations such as New York, NY 10022; pizza 60645; or even BBQ Lockhart TX. (Optional) If the letters you type match names in your contacts list, the matching contacts appear in a list below the Search field; tap a name to see a map of that contact’s location. Maps is smart about it, too; it displays only the names of contacts that have a street address. When you finish typing, tap Search. After a few seconds, a map appears. If you searched for a single location, it’s marked with a pushpin. 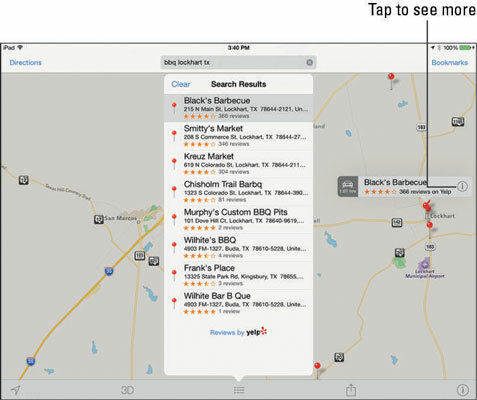 If you searched for a category (BBQ Lockhart TX, for example), you see multiple pushpins, one for each matching location. When you tap the Search field, a handy drop-down list shows the search terms you’ve used recently. Tap any item in the list to search for it again. Maps and contacts go together like peanut butter and jelly. For example, here are two helpful tasks that illustrate maps and contacts at work. Tap the Bookmarks button near the top-right corner of the screen. Tap the Contacts button at the bottom of the overlay. Tap the contact’s name whose address you want to see on the map. Alternatively, just type the first few letters of a contact’s name in the Search field, and then tap the name in the Suggestions list that appears below the Search field whenever what you type matches one or more contact names. Tap the location’s pushpin on the map. 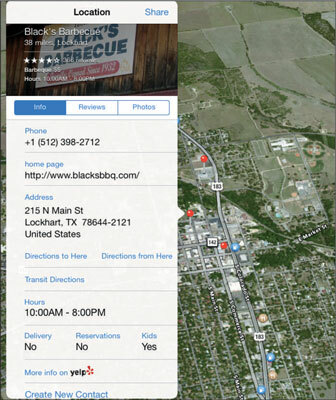 Tap the littleiin a circle to the right of the location’s name (as shown on the right of Black’s Barbecue). That location or contact’s Info screen opens. Tap Create New Contact or Add to Existing Contact, whichever is applicable. Fill in the new contact information and tap Done. Or, select an existing contact from the list that appears. You work with your contacts by tapping the Contacts icon on your Home screen. Don’t forget that you can swipe across your iPad screen with four or five fingers to switch apps. So if you’re in Contacts, a four- or five-finger swipe from right to left should bring you back to the Maps app. If you have a lot of open apps, you might need more than one swipe to find the Maps app. And don’t forget you could also use a four-finger swipe upward or double-tap the Home button to reveal the multitasking screen. If nothing happens when you swipe with four or five fingers, tap Settings➪General, scroll down to the Multitasking Gestures On/Off switch, and make sure it’s set to On. You can also get driving or walking directions from most locations, including a contact’s address — to any other location including another contact’s address.